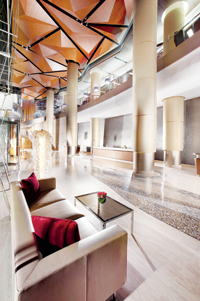 BAHRAIN’S newest luxury five-star destination, Kempinski Grand & Ixir Hotel Bahrain City Centre completed two months of successful operations since its opening in early September 2011. The Kempinski Grand & Ixir Hotel Bahrain City Centre is on the path of becoming a preferred destination of choice with guests returning for an array of delectable culinary experiences and Kempinski’s trademark European sophistication and refinement with the finest of hospitality standards. Stephan Kaminski, general manager, Kempinski Grand & Ixir Hotel Bahrain City Centre said, “After just over a month in operation, we have a significant following of guests who frequent our dining outlets for business or leisure. T-Spoon has gained popularity amongst guests who share an indulgence of delicious handcrafted cakes and pastries accompanied by a rich selection of teas and coffees with friends and family. Saveur is widely appreciated for its extensive a la carte menu and open live cooking stations. In addition, having an enviable location connected to the island’s largest shopping destination, has worked in our favour attracting both local shoppers with our diverse culinary portfolio and international guests with our personalised service and luxurious guest facilities. We are looking forward to building on this success and to celebrate more achievements in the near future,” further added Kaminski. In only the first month of its operation, Kempinski Grand & Ixir Hotel Bahrain City Centre has welcomed both local and international travellers as guests of the five-star hotel with occupancy to date above predicted levels.